Atlantic's innovative design includes a flat, supported top deck with recessed plumbing channels and pocket for the New Triton 3-way manifold. Atlantic Pro Series Fountain Basins incorporate the features, strength, and ease of installation demanded by today's professional installers. Atlantic's innovative design includes a flat, supported top deck with recessed plumbing channels and pocket for the New Triton 3-way manifold. Whether installing a bubbling urn, rock columns or a disappearing fountain, the versatility of Atlantic's Fountain Basins makes them the right product for every job. Note: You can increase the weight capacity from 500 lbs to 1000 lbs by filling the support cones with concrete. To calculate shipping costs: Add a product to the shopping cart. An orange colored "Calculate Shipping" tab will now show up on the right side of your screen in the blue area in the shopping cart section. Click on this "Calculate Shipping" and enter your zip code. Hit "Submit", and your shipping options & delivery times will now be displayed. Since this item ships LTL truck freight on a pallet, there are upcharges put on the delivery if the delivery address is Residential, if you can not unload the truck and require a liftgate, and if you need a delivery appointment. Please use the check boxes above for all that apply. Any additioanl services utilized but not checked off and pre-paid will be added to your charge card automatically. Canadian customers responsible for duties & import taxes. 2. Built in channels simplify installation; allowing the plumbing to be run on top of the basin. 3. (7) molded cones support the top panel. 4. Recessed pocket accepts the Triton 3 Way Manifold. 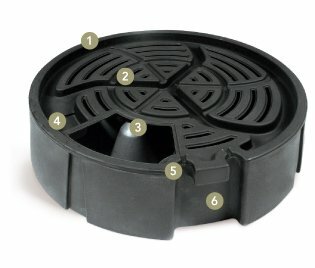 Adjusting the water flow to multiple pieces has never been easier. 5. 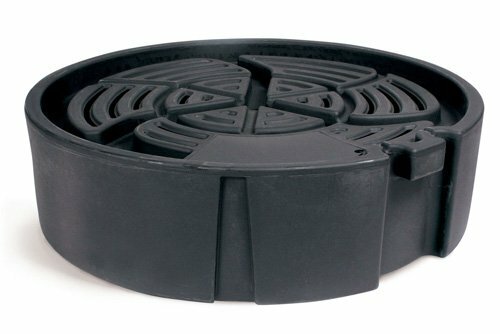 Recessed pockets allow 1-1/2" conduit sleeves to be installed within the radius of the basin; allows access to pump cords and low voltage wiring when surrounding the unit with pavers. 6. Flat panel for the installation of an AF1000 Auto-fill. From steve willis of Mooresville, Indiana on 7/13/2011 .